DRM is sooooo mid-2000s. At long last, Apple has made the right move. 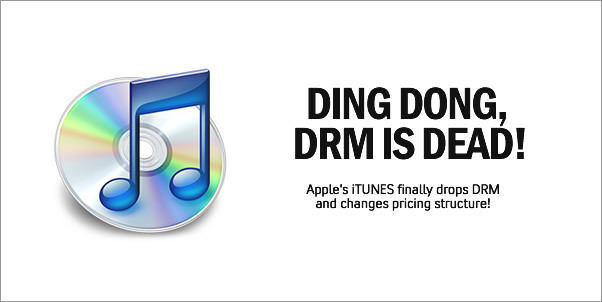 It is ditching DRM. In exchange? You get a new pricing structure (ie. higher prices.)....possibly. Of course it was inevitable. iTunes was long left in the dust created by most of their competitors (AmazonMP3, Yahoo Music, Wal Mart, etc.) who dumped the dreaded DRM some time ago (or never instituted it in Amazon's case). DRM is what caused me to put iTunes to bed years ago. Now, perhaps I may fire iTunes up again and see what they have to offer. Kudos to you, Apple. WHY I LIKE THIS NEW PRICING STRUTURE! From the stand point of us soundtrack collectors...well, I'm going to venture a guess that most of music you and I would want will be in the $.69 range. It all depends on how the pricing curve will work, of course. Will there be a hard price-to-demand-scale applied across all music genres or will it vary? Hopefully it will be the former and that should mean cheaper prices for us. So what do you think about these changes? Hmmm?